I attended the Taste Festival over the weekend, courtesy of tickets from my friends at Liquidity. I ambled over to their stall on arrival to say thank you, and sampled their Pyrat rum (part of the Patron stable) whilst I was there. I’m a big fan of rum and this one did not disappoint. With its bold orange taste it’s a great option, indeed one of the very few options, if you’re looking for an aged rum in SA. The Festival itself was well put together and populated by an interesting variety of stalls, mostly restaurants, but also wineries, bars, and an assorted mix of food and beverage brands. As I mentioned I didn’t pay for my tickets, but I would have been mightily disappointed if I had. It seems that all the entrance fee got you was the opportunity to spend more money. It certainly didn’t seem to have subsidised what was on offer. Tasters from the various restaurants were priced at between R20 to R40, and ranged from ok-fair-enough deals, such as Savour’s Salmon carpaccio and Solms Delta’s Cajun seafood, to ludicrously bad value, witness Nobu’s microscopic yellowtail sashimi. I once had the dubious pleasure of dropping 200 large (as in Sterling) on supper at Nobu, and had to stop at a Burger King on my way home to fill the gap, so no surprise there. A message then to the organisers: come on guys, we like what you’re doing, but don’t take the piss. Ok, now that that’s out of the way, to the serious business i.e. whisky, of which there wasn’t much to be found at the festival. I kept looking however, kept walking if you will, and my efforts were rewarded. 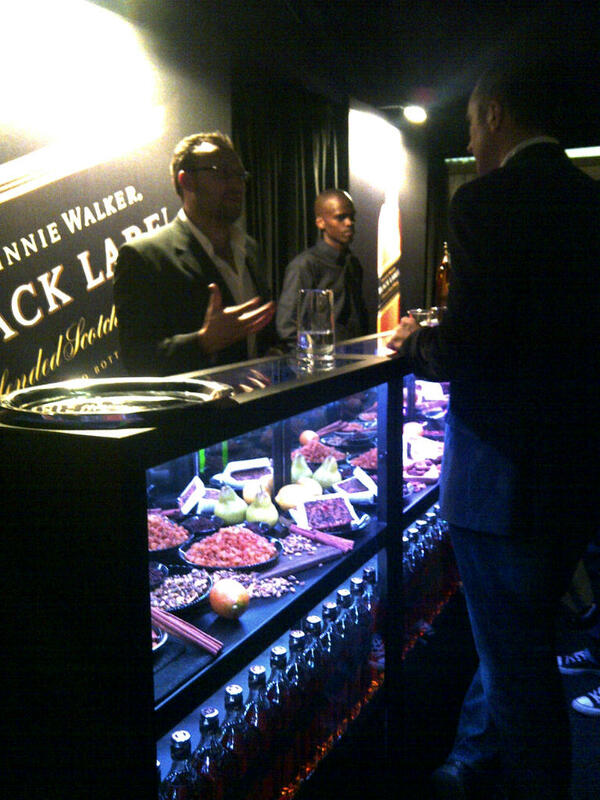 I came upon the Johnnie Walker (JW) stall, beckoning to me like an oasis in the desert…and I needed no second invitation. A few facts about JW– it’s the best-selling whisky in the world, it’s part of the Diageo stable, and its product philosophy is “Big Flavours”. I’ve pondered the latter often. For marketing purposes it’s great positioning. Whisky is all about flavour, so what could be more appealing than big flavours. Bigger is better after all. At this stage it might be worth having a quick aside on the topic of chill filtration. Chill filtration is a process that takes place before bottling in which whisky is cooled and passed through a fine mesh filter, trapping and removing certain congeners (fatty acids and oily compounds) that tend to precipitate at lower temperatures. The finer the filter and the more extreme the cooling, the greater the amount of congeners removed. This is done for aesthetic purposes, so that the whisky does not appear hazy, especially when ice is added. However these congeners are a significant contributor to flavour, so many whisky-makers choose not to chill-filter their whiskies, labelling them “non-chill filtered”. The bottom line is that chill filtering extracts flavour from the whisky. Ok, back to JW. My question is – does the “Big Flavours” philosophy represent the reality of the product or is it just a line fed to consumers? Well, the range of JW’s is chill filtered. In fact if my industry sources are to be believed, Diageo has a particularly aggressive approach to chill filtering, using fine filters, and low (-4°C) temperatures. I can’t definitively confirm if this is true either generally or specifically for JW, but for the sake of conjecture let’s assume that it is. What does this say about the commitment to “Big Flavours “? Isn’t the removal of flavour at odds with such a claim? Perhaps “Style over Substance” would be more accurate? The tasting itself was exceptional; short of the Glenmorangie Signet sonic tasting, probably one of the best I’ve experienced. The hosts were knowledgeable, the props, lit display cabinets containing flavour cues, were perfectly atmospheric, and the whiskies, as I mentioned, were superb. JW Red is not amongst my preferred whiskies – the Talisker inspired salty-smoky flavour, whilst interesting, is a bit abrasive for me – but Black and Green, the other variants showcased at the tasting, are standouts. On that note – keep reading (my blog), keeping drinking (responsibly) and keep well. 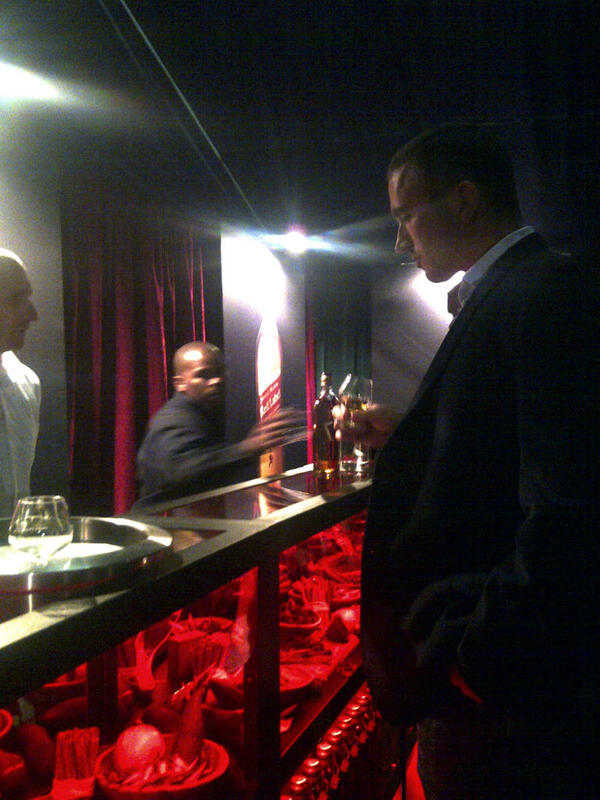 This entry was posted in Uncategorized and tagged Johnnie Walker, Tasting, Whiskey, Whisky. Bookmark the permalink.